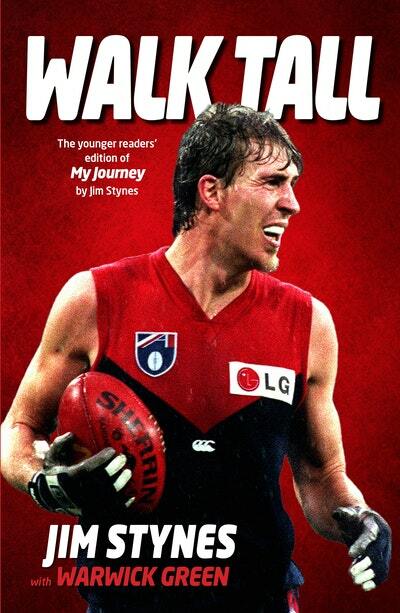 Walk Tall is a special younger readers' edition of the Jim Stynes autobiography My Journey, adapted by Warwick Green. Part football autobiography and part coming-of-age story, Walk Tall is an inspirational and unforgettable account of a man who continues to inspire through his life and his legacy. Walk Tall is a special younger readers' edition of the Jim Stynes autobiography My Journey, adapted by Warwick Green. Part football autobiography and part coming-of-age story, Walk Tall is an inspirational and unforgettable account of a man who continues to inspire through his life and his legacy. There were men in strange jerseys on the TV, running around with some kind of rugby ball. What's the big deal about that? I thought. At first, Jim Stynes didn't understand Australian football at all. But once he accepted the challenge to play, there was no stopping him. Jim never took the easy road, on or off the football field. He pushed himself, and he worked hard to help others realise their potential. In this special younger readers' edition of his bestselling autobiography, Jim Stynes shares his early life as a knockabout kid growing up in Ireland, his move to Australia as a teenager and his rise to football stardom, with all the trials and tribulations along the way. Love Walk Tall? Subscribe to Read More to find out about similar books.